Robert Downey, Jr., Chris Hemsworth, Mark Ruffalo, Scarlett Johansson, Jeremy Renner, James Spader, Samuel L. Jackson, Don Cheadle, Anthony MacKie. 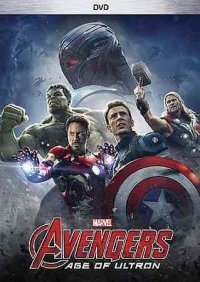 Enjoyable Superhero Flick submitted by kaymbre on July 19, 2016, 10:59am While not as fresh and exciting as the first Avengers outing, Age of Ultron certainly didn't disappoint. Big story. Big characters. Big battles. Warning to the purists: The filmmakers did take some liberties with the origins of one or two of the characters (limitations of real-world licensing). Still an enjoyable popcorn film with occasional moments of thought provoking storytelling. Avengers submitted by leenajong on August 2, 2016, 10:30am Love the movie! Very entertaining. Fun Superhero Flick submitted by Meginator on August 10, 2017, 9:59am This film proves that whoever is running the Marvel Cinematic Universe has clearly thought out how each of the characters' storylines and personalities will interact, and the result is an ensemble film that is engaging despite the multitude of storylines. Moreover, you don't need to see all of the previous Marvel movies to make sense of this one, thought it helps to have a basic familiarity with the characters (especially, in this case, Tony Stark/Iron Man). The story itself is surprisingly complex for a popcorn action film, and the stakes are suitably high, even if the film does venture a bit into the absurd. The film does feel like it has real consequences for the characters and the MCU, and overall it fits right in with what they're doing; if you're already on board, you'll probably like this one. Another good Marvel movie! submitted by Xris on June 26, 2018, 12:44am James Spader voicing the villain is great!! We get introduced to new characters that were hinted at in another Marvel movie. I also love that Paul Bettany's character finally gets physical form! Age of Ultron submitted by SBNB on August 19, 2018, 9:36pm I liked it. I still prefer the first Avengers movie, but this one was good. It took me a few minutes to figure out who was voicing Ultron. It was so familiar, and then it came to me. Reddington from the Blacklist! It was a perfect pairing.